Halloween party games ideas must be original and scary! The entertainment you choose could be the difference in how successful your party turns out. What to do? That will all depend on the age group. Be sure to select age appropriate games to keep the festive atmosphere alive. One Stop Party Ideas can help you decide which games will best suit your party. Guests young and old will scream for more with these spooky game ideas. 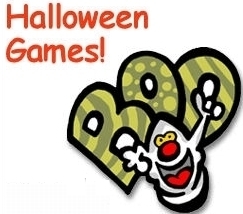 Halloween Kids Games entertain little ghosts and goblins and bring out the kid in all of us. Plan Halloween pumpkin decorating, games and activities that the children will be talking about for weeks and remember for years. Let the games begin. . .
Bouncing Jack-O-Lanterns - Decorate orange ping pong balls into jack-o-lanterns. Hollow out five to six pumpkins or use plastic pumpkins and place in a row. Each child is given a ball and tries to bounce their ball into the pumpkin. For smaller chidren decorate large baskets or plastic buckets with jack-o-lantern faces. Carnival – Arrange different stations with different activities or games. Halloween party songs playing in the back are an assett to the carnival theme. Here are some examples. . .
Face Painting Station - Have someone available to paint the children’s faces or maybe apply tattoos. If you can’t think of anyone, try kid friendly tattoos instead. The Halloween tattoos are easy to apply and the kids love them. Pumpkin Decorating Station - Have markers, stickers, yarn, pipe cleaners, construction paper, scissors and glue available for the children. Award a prize for the best pumpkin or award them all for their participation. Sometimes with teens, it is not so much what you do as it is providing the opportunity for them to interact socially. Although they may think they are too old, you can find creative ways for them to enjoy a fun Halloween party. On your invitations, give clear instructions for teens to come attired in their best Halloween costume. Award prizes to Halloween costume winners for the most original, funniest or scariest costume. Arrange the help of several parents to participate in a progressive dinner. Plan a complete Halloween party menu with each course offered at a different home. Begin the Halloween adventure with appetizers and progress through dessert. You may want to conclude your evening with a trip to a haunted house. could result in a frightfully good time! Keep the Halloween party excitement alive! Greet guests with Halloween party songs to heighten the spooky mood. With the mysterious visitors and eerie music, you have set the stage for a frightfully fun party. Halloween party game could be creepy crawler diving. This is done by using Halloween gummy candies hidden in whipped cream in decorative bowls. Each child is given a bowl and the first child to retrieve all the candies wins.